Airports across the globe would be struggling due to capacity constraints in the coming years except those in Dubai, Mideast and China, said a top official of Dubai Airports. "There are some storm clouds on the horizon. Today, 10 million passengers step on board aircraft every day and if the projections prove right, around 21 million people will be stepping on planes every day by 2034," said Paul Griffiths, CEO, Dubai Airports. "But will the existing system and expansion be able to cope with the growth? If we look around the world, the amount of airport capacity is way short of what is required. However, not here in Dubai," the industry veteran said. As billions of dollars are invested in airport and related infrastructure in Dubai, the emirate's airports look set to fly past their peers in the world in the coming decade and improve its ranking worldwide. According to Airports Council International, Dubai International maintained its ranking as the third busiest airport in the world last year with 88.24 million passengers. But it could dethrone China's Beijing airport from its second place if DXB slightly improves it growth rate in the next few years. "Dubai has long understood how to well-plan airport infrastructure. We have invested $12 billion since 2008 to boost capacity of Dubai International to 90 million and our long-term plan for Al Maktoum International Airport will be capable of being expanded to 240 million passengers annually. However, the story is different in other parts of the world. Outside Middle East and China, where over 100 airports are under development, putting a new airport infrastructure seems pariah to most of the governments. Europe, in particular, will struggle to cope up with the capacity constraints. 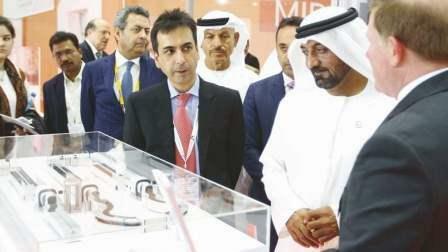 Globally, we need more capacity, higher levels of security and greater personal service," Griffiths said at the opening day of the Airport Show which began at the Dubai International Convention and Exhibition Centre (DICEC). Earlier, Sheikh Ahmed bin Saeed Al Maktoum, President of Dubai Civil Aviation Authority and Chairman and Chief Executive of Emirates airline and Group, inaugurated the 3-day exhibition. Dubai Airports CEO predicted that most of the growth in the next 15 years will come from Asia-Pacific region with 1.8 billion journeys originating from this region. Globally, the number of journeys will increase from 4 billion in 2017 to 7.8 billion in the next 15 years. He noted that there are many industries that are going to decline due to introduction of new technologies but some will buck the trend. Growth in travel and tourism industry is a beacon of hope. Currently industry supports 298 million jobs globally and this is set to rise 382 million by 2027, a growth of 28 per cent. Around $7.6 trillion was contributed by the aviation industry to the global GDP during 2016 and it will be $11.5 trillion by 2027, globally. "All these numbers show future travel looks very bright," said Paul Griffiths. According to figures released by data service provider BNC Network on Monday, currently 95 airport construction projects are underway with an estimated value of $49 billion in May 2018. Among these, 68 projects worth $45 billion are airport terminal projects while 27 projects worth more than $3 billion involves hangar, runway and ancillary facilities. "The expansion of the airline fleet will put additional pressure on the region's aviation infrastructure in the future. Therefore the investment in airport capacity expansion as well as the development of new airports will help manage the future demand of air traffic," said Avin Gidwani, COE, BNC Network. "The airport projects are broadly in line with the development of the region's aviation sector that is led by two UAE carriers - Emirates and Etihad Airways as well as other leading regional airlines such as Saudi Arabian Airlines, Qatar Airways, Gulf Air, Kuwait Airways, Air Arabia, flydubai and Oman Air," he said. Due to increase in passenger traffic, Paul Griffiths pointed out that "what we hate about travel such as visa and passport checks and multiple disconnected processes can be removed by technology." "We need to work better as an industry across the globe for the seamless travel experience. Technology method of identification is still in research stage," he said adding that reliable biometrics are key. He also mentioned about hand vein recognition technology which will help for the quick 'no go' and 'go' decisions at the airports. He emphasised that single point of check-in will ease travel experience for passengers. He said in future Pod will help for non-stop transfers of passengers to planes in few minutes. According to the aviation think-tank Capa, up to $1.1 trillion is spent on airport construction globally - this is broken down by $255 billion being invested in new (Greenfield) airport projects around the world and $845 billion in projects such as new runways and terminal buildings, runway and terminal extensions.